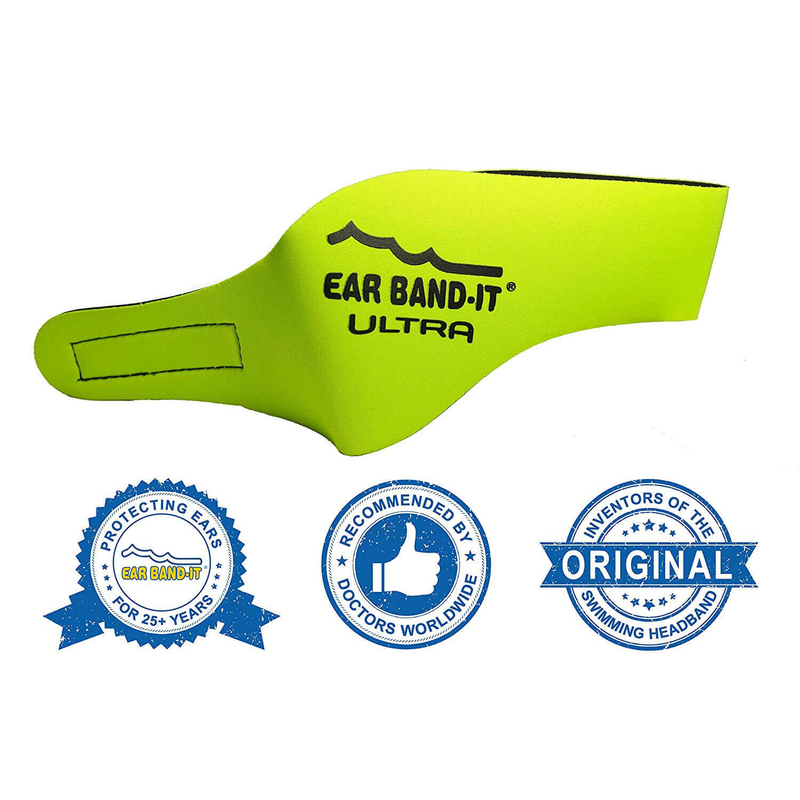 EAR BAND-IT ULTRA Swimming Headband – The World’s Best and Most Advanced Swimming Headband! 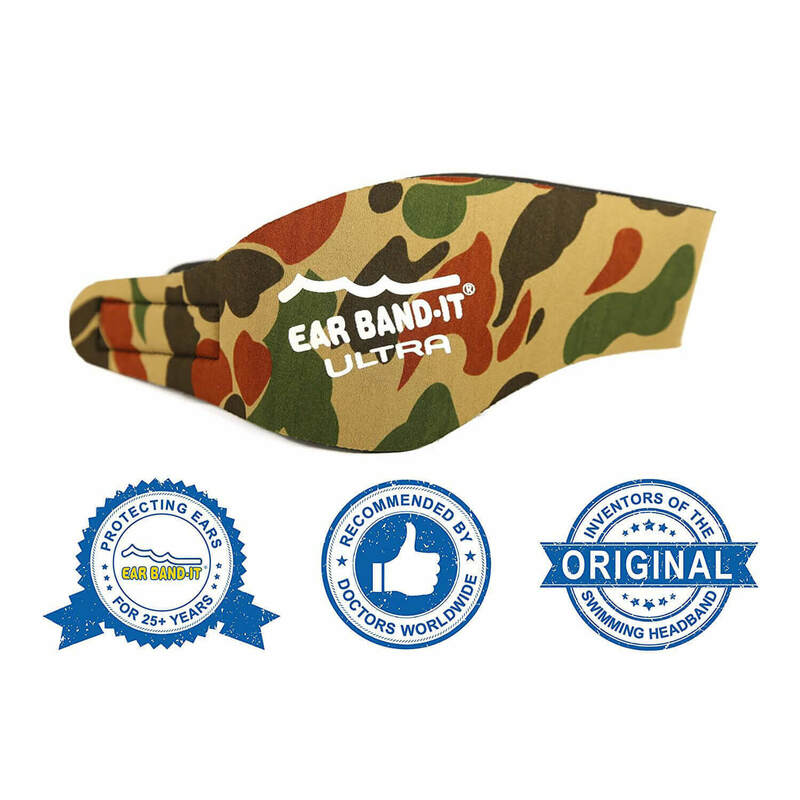 The Ear Band-It Ultra is brought to you by the makers of the Original Ear Band-It, the ORIGINAL swimming headband. 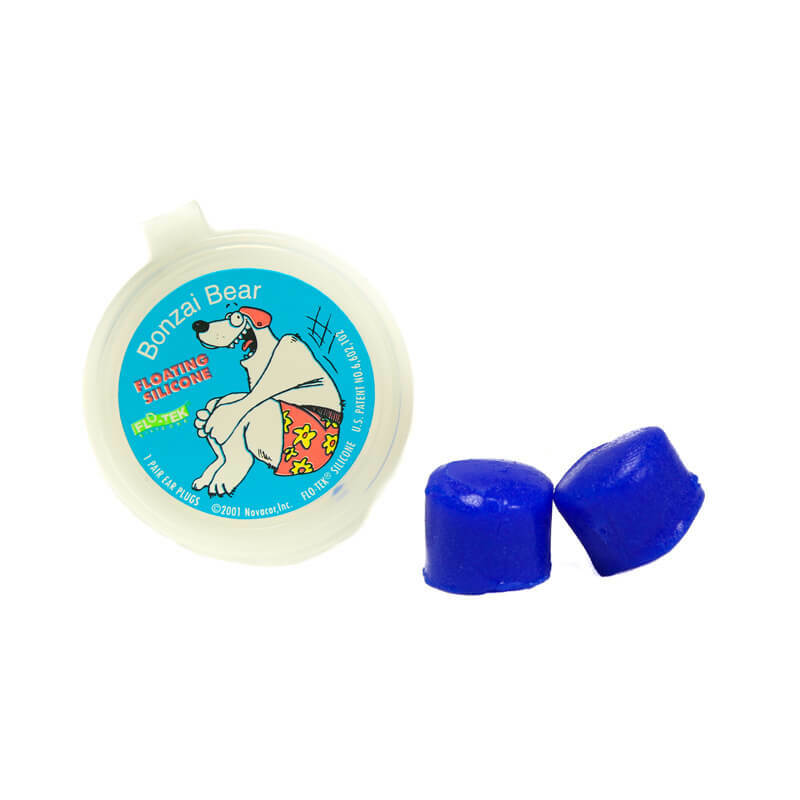 Developed by a board certified Ear, Nose & Throat Physician and designed to keep water out of the ears, providing maximum comfort and safety while swimming and bathing. 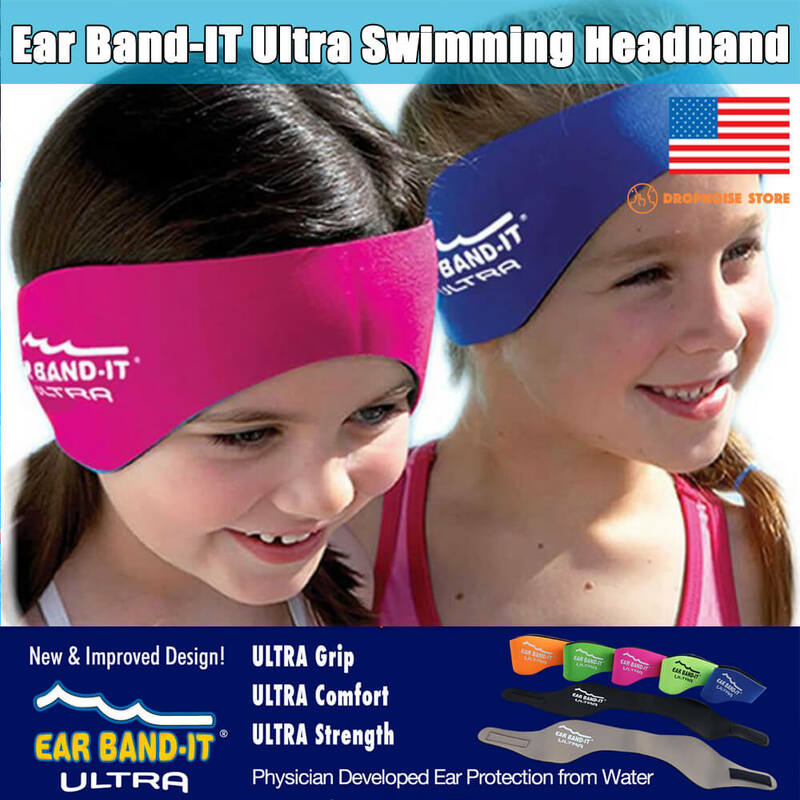 It is the ONLY swimming headband in the world invented by a physician and recommended by doctors worldwide! After 20 years of development we are proud to introduce the new and improved Ear Band-It Ultra! Made with a custom inner lining that provides extra grip to avoid slipping off the head. Also made of a much more soft and comfortable neoprene material. 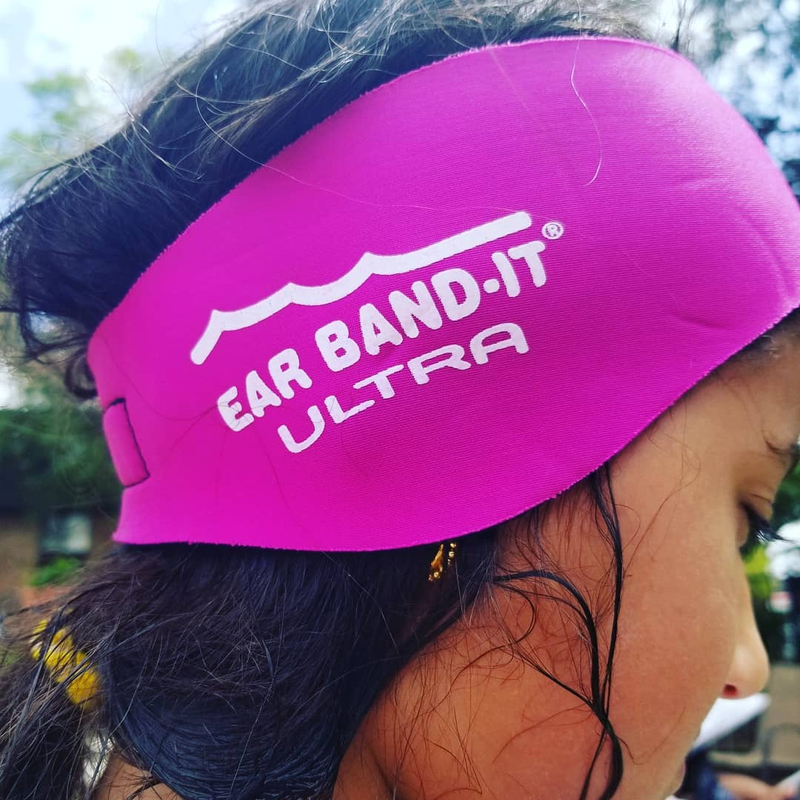 Water enthusiasts of all ages will appreciate using the Ear Band-It Ultra headband to keep earplugs in place and to aid in the prevention of swimmer’s ear. Available in 3 sizes for all ages and the best fit possible! Size Large: Recommended for ages 10 to Adult. Fits head size range 20″-24″The recommended age ranges are usually accurate but the most accurate way to select a size is to measure the head. Simply use a soft measuring tape and measure as the headband should be worn: From the hairline in the front/forehead, diagonally across the ears, around the hairline at the back of the neck, back up/across the ears, and around to the front hairline where you started. Then reference the size chart. ULTRA Comfort! ULTRA Grip! ULTRA Strength! Discover the ULTRA difference yourself! Ultra Comfort – Made of 100% super soft neoprene material. Much more soft and comfortable than any other swimmer’s headband. Ultra Grip – The inner lining is textured with our special Grip-Tek neoprene material. This helps to avoid slipping off the forehead when really active in the water. 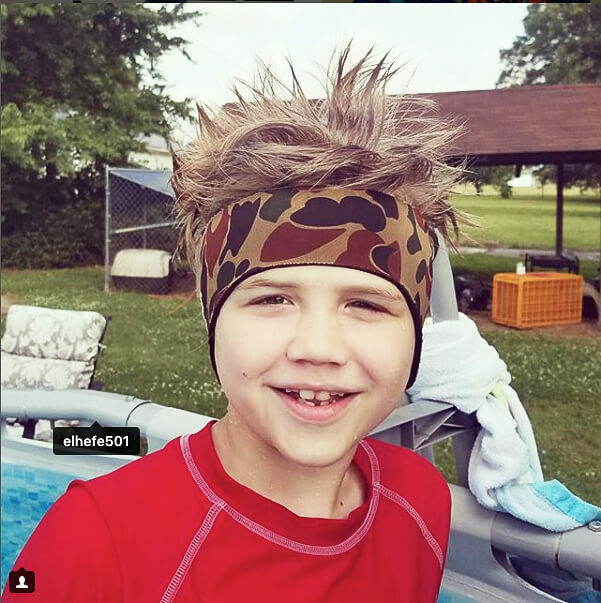 No other swimming headband in the world features this! KEEP WATER OUT, HOLD EAR PLUGS IN! The PERFECT water protection solution for everyone! 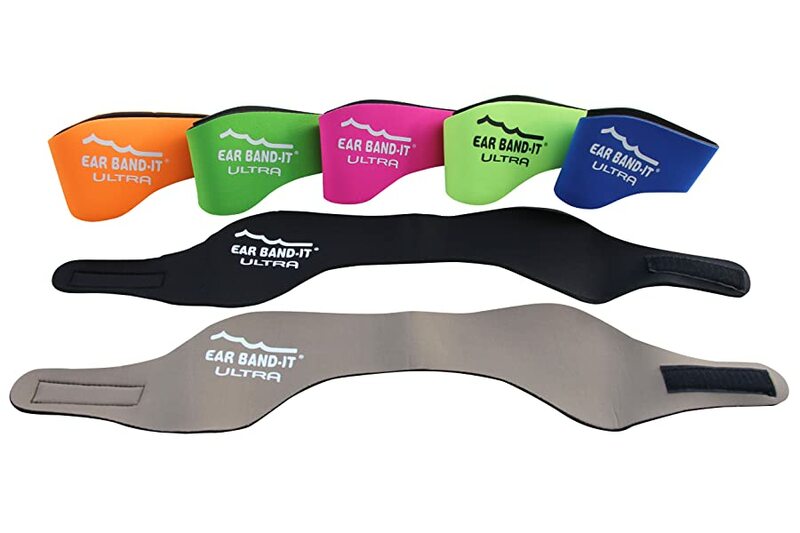 The Ear Band-It Ultra is much more tough and durable compared to other swimming headbands. It also contains a special inner lining with extra grip! 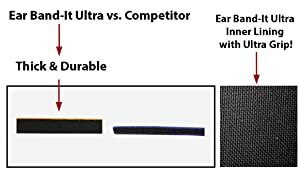 The Ear Band-It Ultra is the most advanced swimmer’s headband in the world! Invented by an ENT Physician and designed to hold earplugs in place while engaging in water activities. RECOMMENDED BY DOCTORS WORLDWIDE. Perfect for ear tubes, perforated eardrums, myringotomy, myringotomy tubes, otitis media, and otitis externa. Great for swimming, bathing, surfing, water skiing, canoeing, and kayaking. Perfect for traveling to the pool, lake or beach. 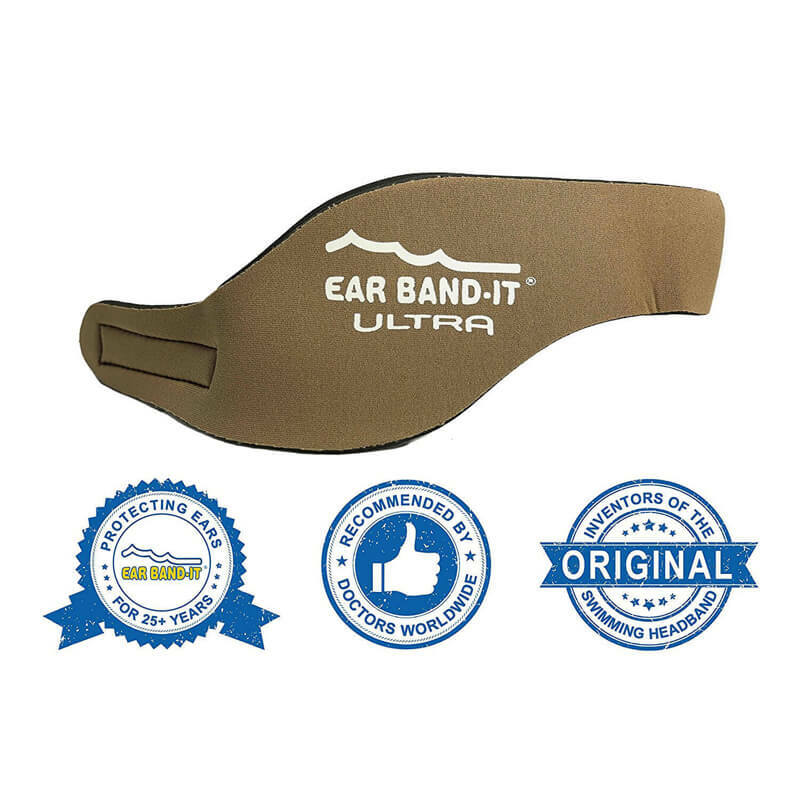 What is the difference between the Ear Band-It® and Ear Band-It® Ultra? The Original Ear Band-It® was invented 25 years ago but is still a very effective way of keeping earplugs in place and blocking water. After two decades of customer feedback we decided to create the Ear Band-It® Ultra which is a new and improved version. The “Ultra” is made of a much more soft and comfortable neoprene. The neoprene material is also more thick and durable. 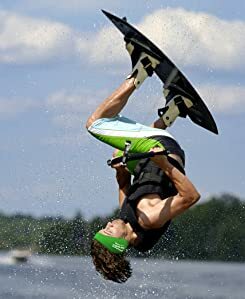 Perhaps the biggest improvement is the inner lining which features a textured grip to help avoid slipping down the forehead if the user is really active in the water. There are several more improvements and for not much more $ it is a much better headband. In fact the most advanced and best swimming headband in the world. 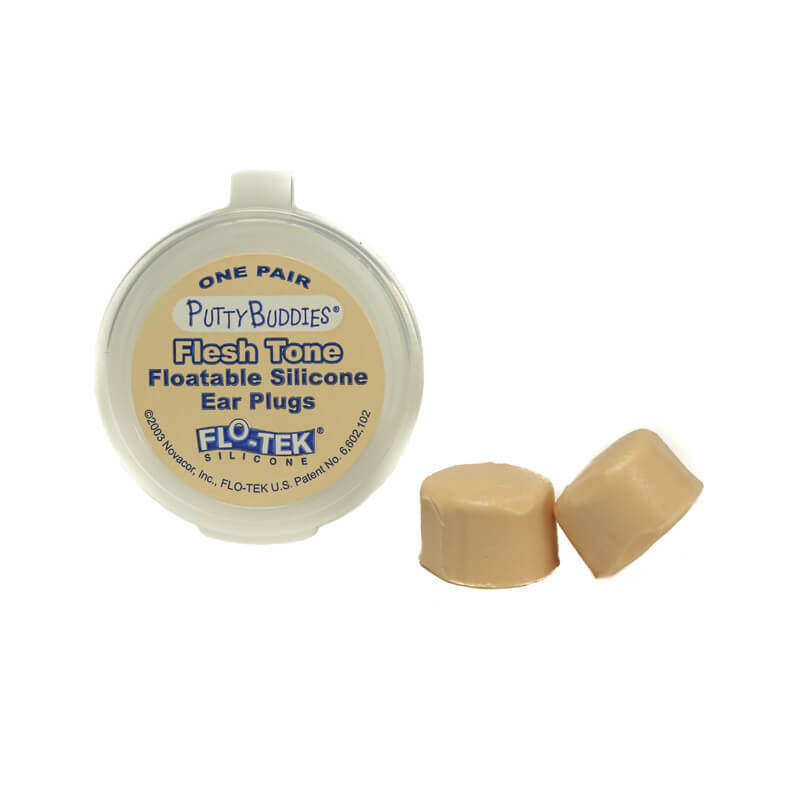 What is the difference between the Original Putty Buddies® and Floating Putty Buddies®? Simply one floats and one does not. They are both super soft and tacky in texture (why they stay in place so well). 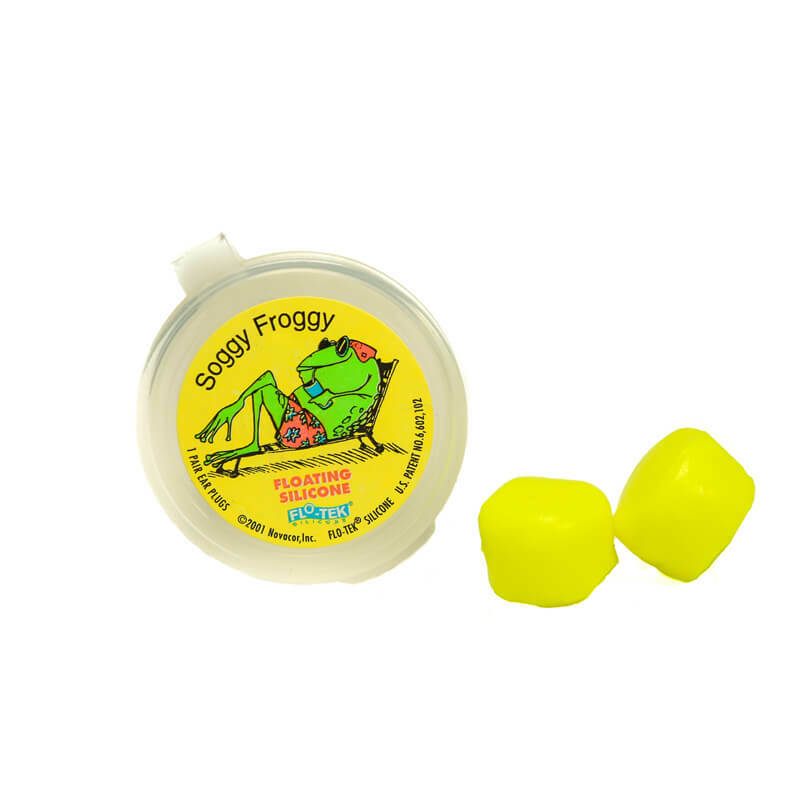 The Floating Putty Buddies® are the world’s only soft moldable silicone ear plugs! They float on water if dropped or dislodged. Is the Ear Band-It® waterproof? No, neoprene is not a waterproof material, although it will keep the majority of water out of the ear canal. The purpose of the band it to hold ear plugs or ear molds in place to form a watertight system. 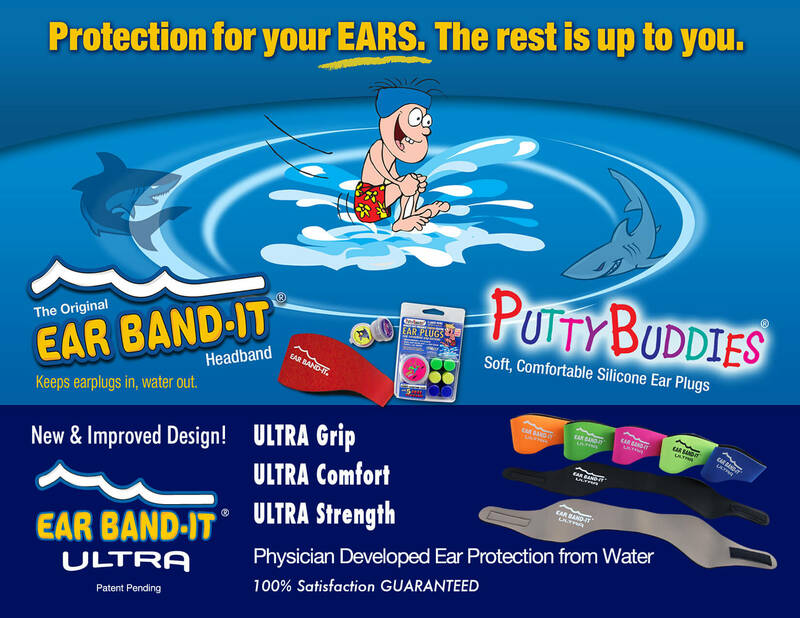 The Ear Band-It® should not be worn by itself if the intent is to prevent water from entering the ear canal. 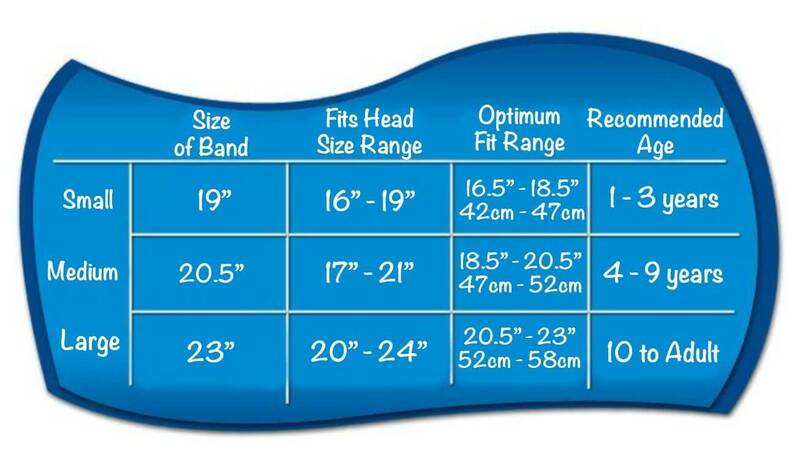 Where do I measure the head for the correct fit for the Ear Band-It®? Measure from the hairline in front across the ears to the hairline in the back (I.e. downward angle). Use a cloth tape measure if you have one or use a string and the measure from the string. Be sure to not pinch the tape or string together as this will create extra length. You should wrap the tape or sting around the head and note where they intersect. How long will the Ear Band-It® last? The answer to this question depends on usage. With heavy usage, the band may last approximately two years. Some people are still using bands that are five years old! The usual reason for ordering a new band is the fading of color. The ear plugs may become dirty or tacky after three weeks with heavy usage, or last quite a bit longer with light usage. 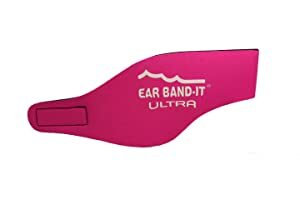 Can you dive with the Ear Band-It®? 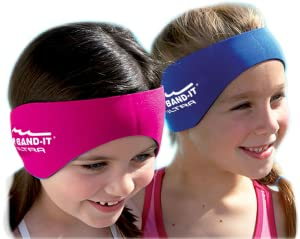 We do not recommend diving head first with the Ear Band-It® as the band may come off the head. The band will float, however, for easy retrieval. Swimming and jumping in the water feet first are not a problem. 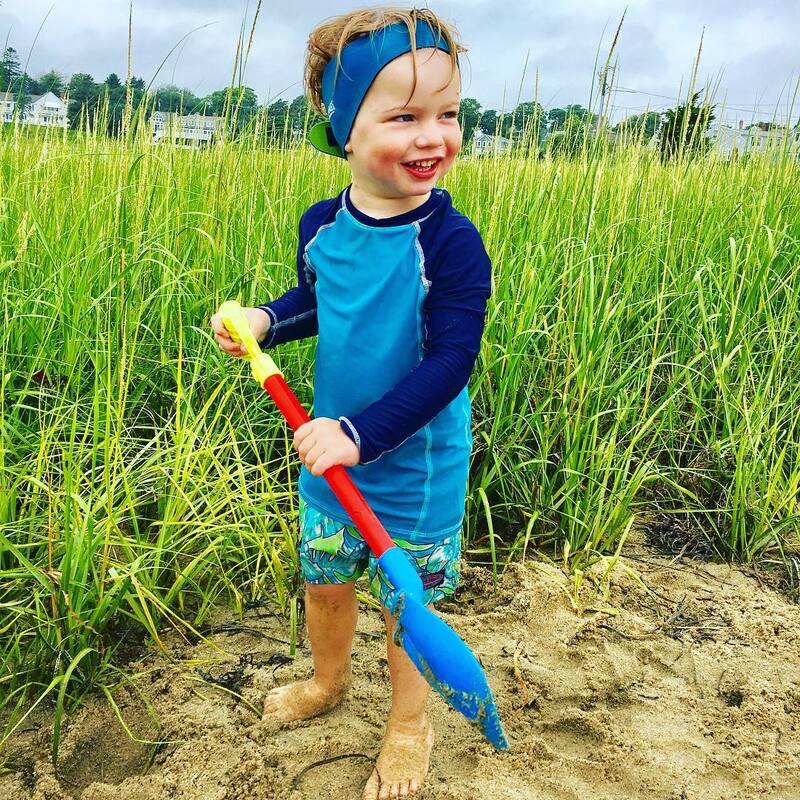 Will my child be compliant in wearing the Ear Band-It®? Every child is different, of course, but most children enjoy wearing the Ear Band-It®. The band comes in five assorted, bright and attractive colors to please even the most selective of children. 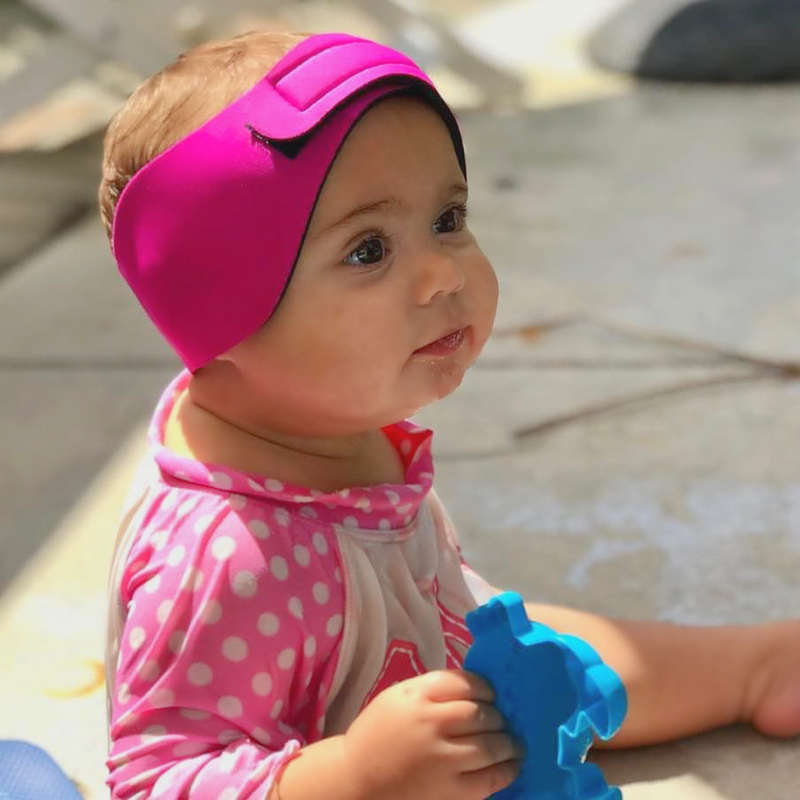 Given the option of not swimming at all, or perhaps wearing an unsightly bathing cap, most children jump at the chance to wear the Ear Band-It®. We’ve heard many stories of children still wearing the band even after their ear problem is resolved. Is the Ear Band-It® safe to wear? 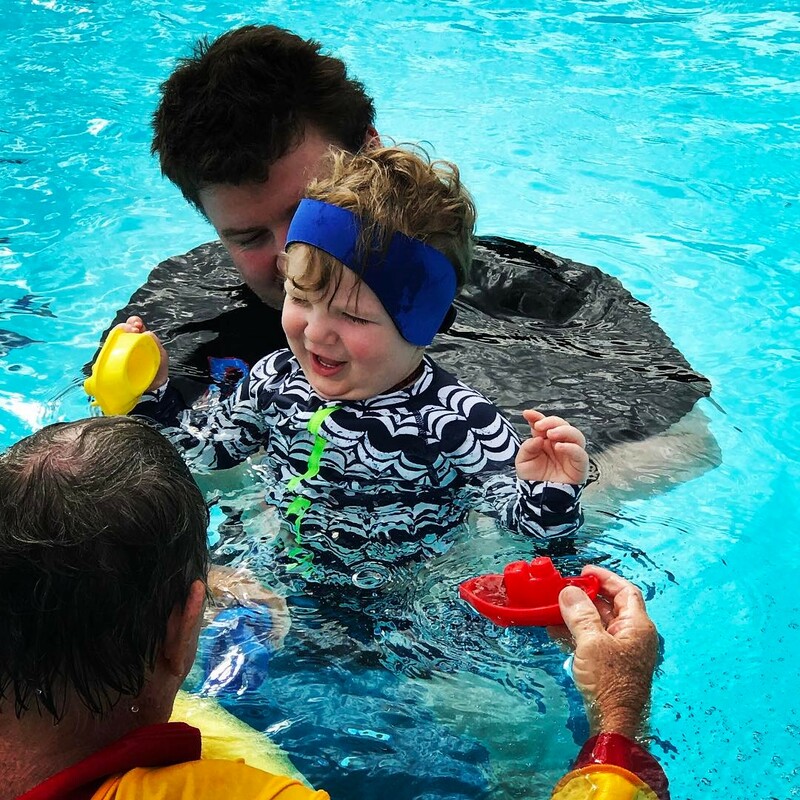 The Ear Band-It® ear protection system was developed and patented over 10 years ago by a board certified otolaryngologist (Ear, Nose and Throat physician) in response to the lack of a practical way to allow people with ear problems to swim and bathe safely. 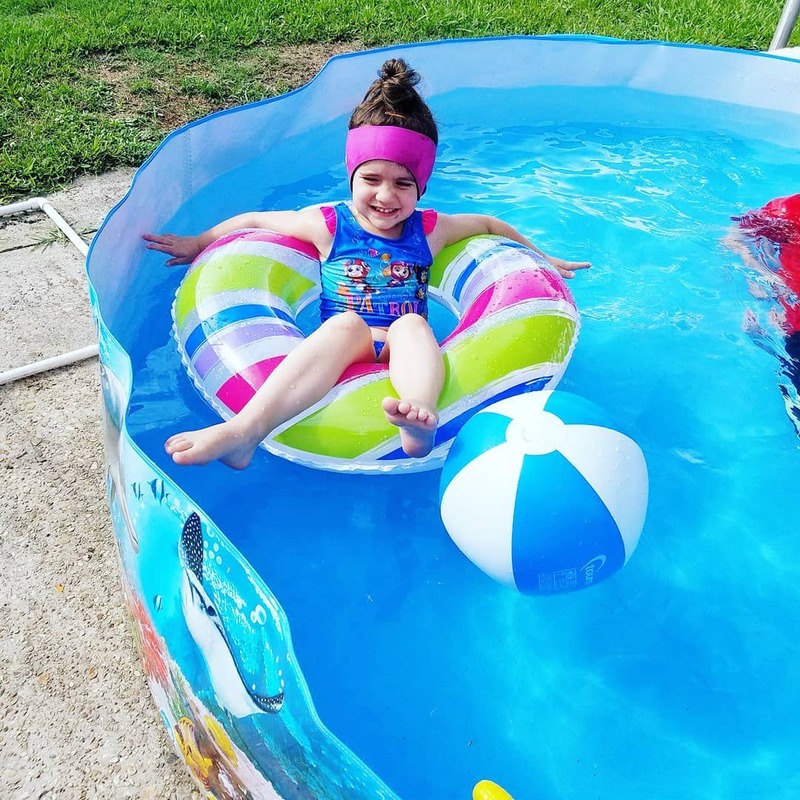 The band is specifically designed to avoid slippage during normal water activities and keep ear protection devices solidly placed over the ear canal. Hundreds of thousands of satisified children and adults have purchased the Ear Band-It® over the years and the product is recommended by otolaryngologists and audiologists around the world. Does the Ear Band-It® float? The Ear Band-It® does float, but ear plugs in general do not. 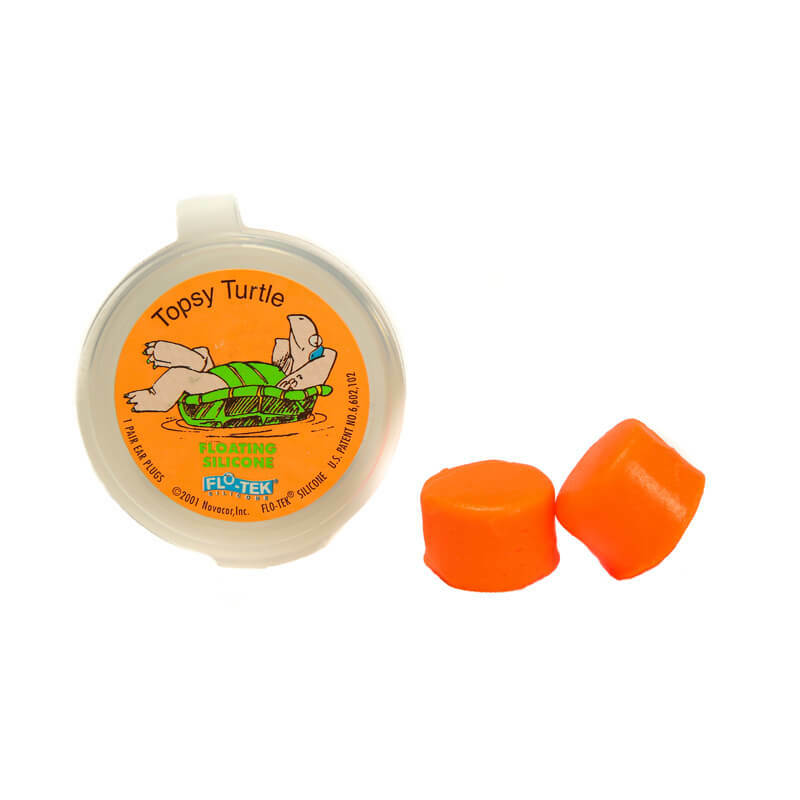 However, our new floating Putty Buddies® ear plugs with our patented Flo-Tek® silicone do float. 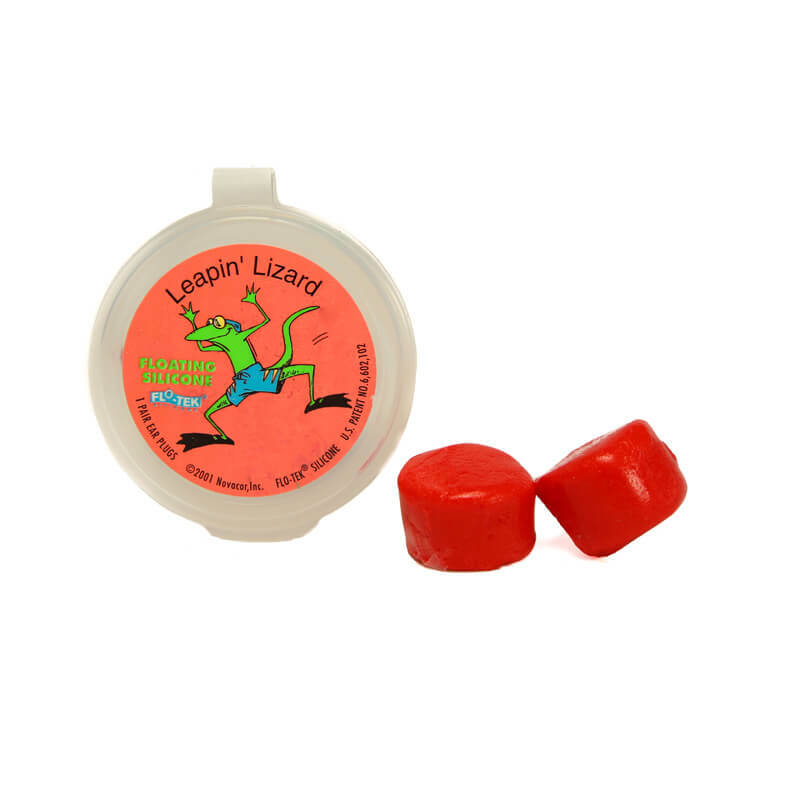 They are the only moldable, floating, silicone ear plugs in the world. Try a pair. Can you use Ear Band-It® for bathing and showering? Absolutely! 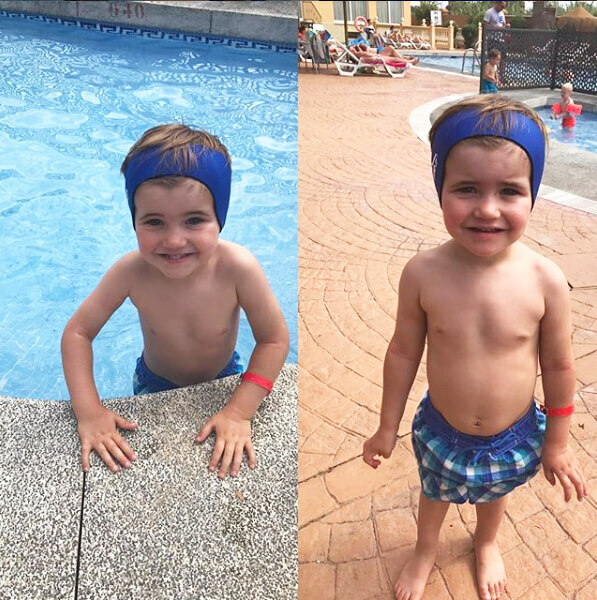 The Ear Band-It® is excellent for swimming, bathing, showering and keeping your ears warm. Are you able to swim/bathe with a hearing aid if wearing the Ear Band-It®? No. The Ear Band-It® is not waterproof. Your hearing aid may become wet and damaged if your only protection is the Ear Band-It®. Do you need to wash the Ear Band-It®? No. The Ear Band-It® will stay clean from the chlorinated pool, bathtub or shower. If you feel the need to wash the band or it becomes stained, we recommend hand washing and air drying. Are you able to hear while wearing the Ear Band-It®? Yes, although you will not hear as well as you would with nothing covering your ears. The ear plugs are the limiting factor here, as neoprene does not significantly impair hearing. Is the Ear Band-It® comfortable to wear? 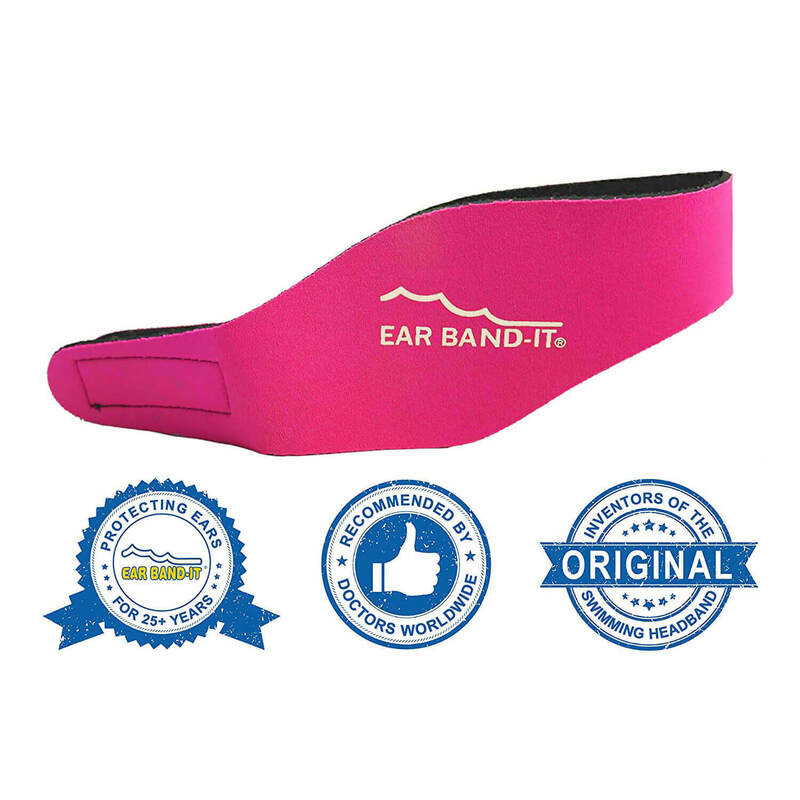 The Ear Band-It® is very comfortable to wear and loved by both kids and adults. 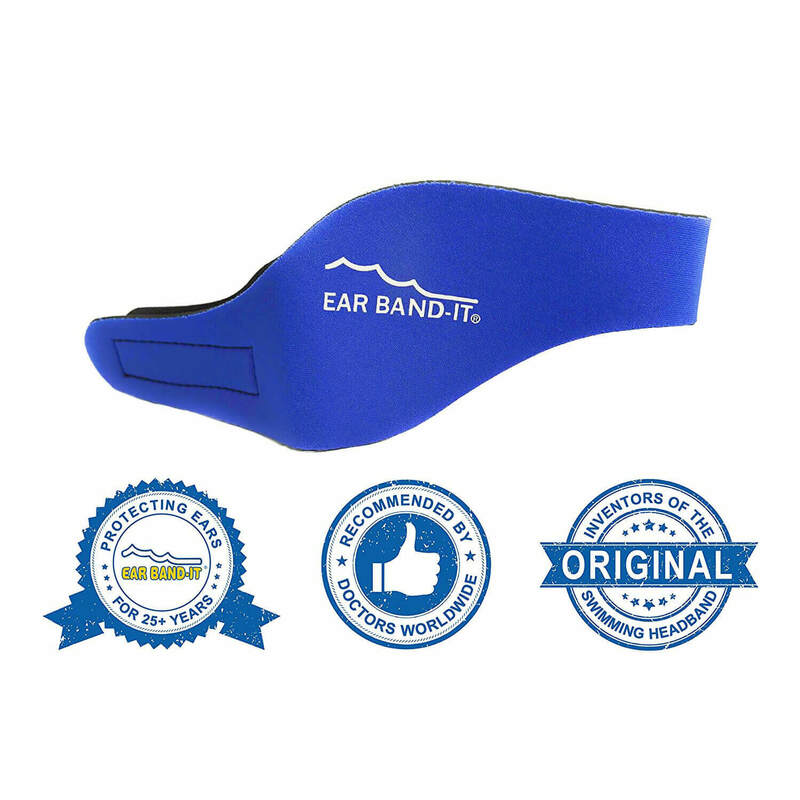 The Ear Band-It® is made of neoprene, the stretchy material used to make wet suits. Additionally, the band comes in three different sizes and may be adjusted with a three inch Velcro® type closure in the back. This flexibility enables the Ear Band-It® to fit comfortably on all head sizes. Refer to the easy Size Chart for more details on size ranges. I would just like to say thank you to Dr Malkoff and his company. My daughter has had ear problems since birth. The continued infections, burst the drum, left so much scar tissue that after the tubes, the incision would not close on the right ear. After one tempanoplasty, which was not a success, and finding approximately 90 – 95% damage, she is now left with a perforated eardrum. We will try the surgery again, but not for another year and a half, until she is between 16 – 17 years old. In the meantime, we have been through the swim caps, the name calling, and the years of being left out. Since the ear band-it, recommended by her doctor, she has been able to be the sporty, outgoing, happy girl that life intended her to be; without having to be so self-conscious about the way she looks. She says “The ear band-it is cool, it’s like a headband.” What’s even better is that her friends say it’s cool too. (Some have even asked her where she got it so they could get one too, and they don’t even have ear problems.) So, I just wanted to say thank you for helping my daughter through life. My daughter was born with chronic ear infections and has had numerous surgeries on her ears. The ear bandit was a life saver when she wanted to swim. When we did not use the ear bandit and plugs she would always get an ear infection. The ear bandit saved us money on doctor bills, no more ear infections due to swimming, thanks.